For the longest time, I searched for an orange cake that was as bright and citrusy as I thought an orange cake should be. 4 years ago, I finally found it. 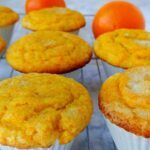 These orange cupcakes (or muffins – call them what you will) are loaded with both orange juice AND pureed clementines, making them burst with orange flavor. They’re springy (in both texture and seasonality), fluffy, and super moist. 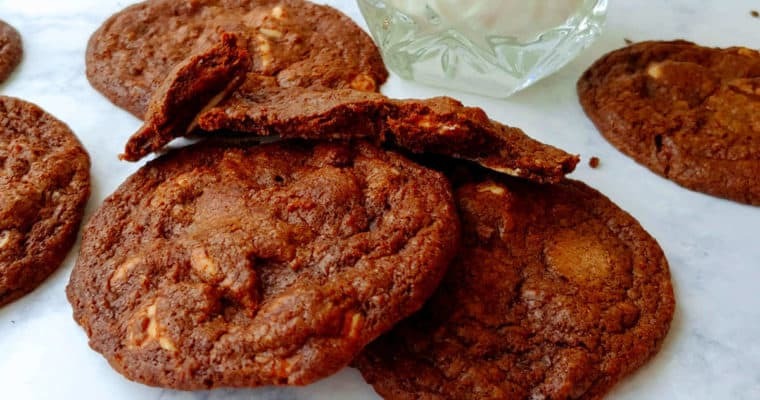 As a bonus, they happen to be vegan – dairy and egg-free! 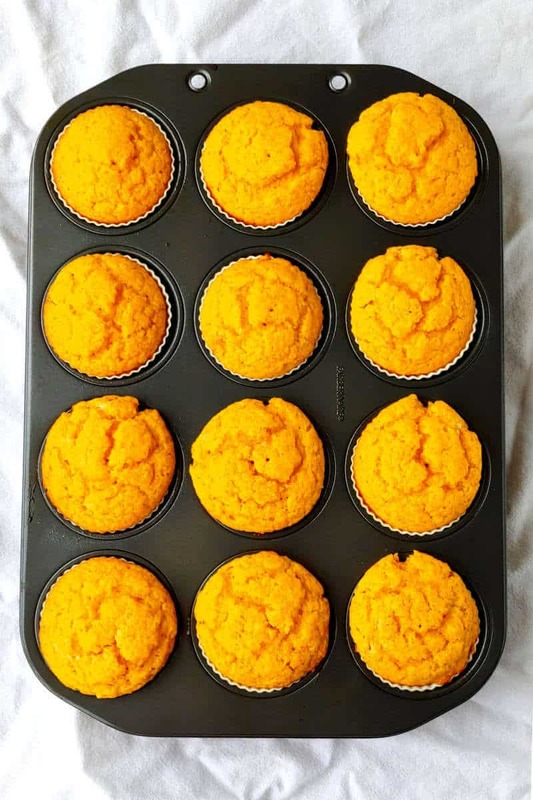 I first made these Vegan Orange Cupcakes almost exactly 4 years ago when my great friend Kate came to visit shortly after Amelia was born. She happened to visit me over her birthday. (Such an awesome friend!) So I knew I had to bake her something. 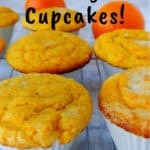 I knew these citrusy cupcakes were just the thing we needed. April is nominally spring, but the weather that weekend, if I recall correctly, was anything but. The weather was cool and breezy; we visited the Ocean City boardwalk, but were well-bundled, and otherwise skipped leisurely walks I’d looked forward to. The secret to these orange cupcakes isn’t that they’re vegan, although that’s pretty cool. 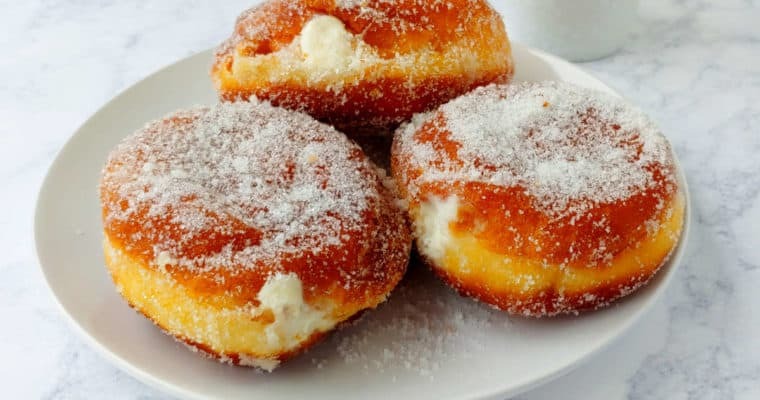 The amazing thing about them is the pureed oranges in the batter. It’s actually a happy accident stemming from my laziness. The original recipe called for peeled and diced clementines or tangerines. Honestly, I hate peeling and dicing just about anything. Clementines are seedless, so I decided to blend the fruit instead, peels and all. If you’re using good clementines with a thin peel, the zest adds so much flavor, and all that zest adds moisture to the cupcakes. They’re flavorful enough and sweet enough from the orange puree and orange juice that I ditched frosting the cupcakes. Whatever kind of orange you use, you want it to be thin-skinned, seedless, and sweet/not bitter. I’ve always used clementines (cuties, mandarins, whatever you’d like to call them). I bet kumquats would work, but what a waste to not just eat them out of hand. 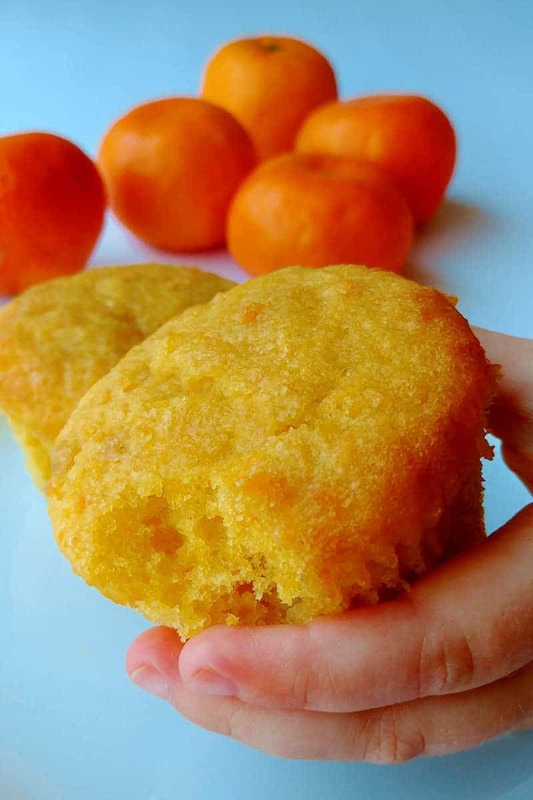 In any case, if your oranges are getting old, you’ll taste it in your cupcakes. Sometimes cooking is the best way to use up old fruit, but don’t do it here! 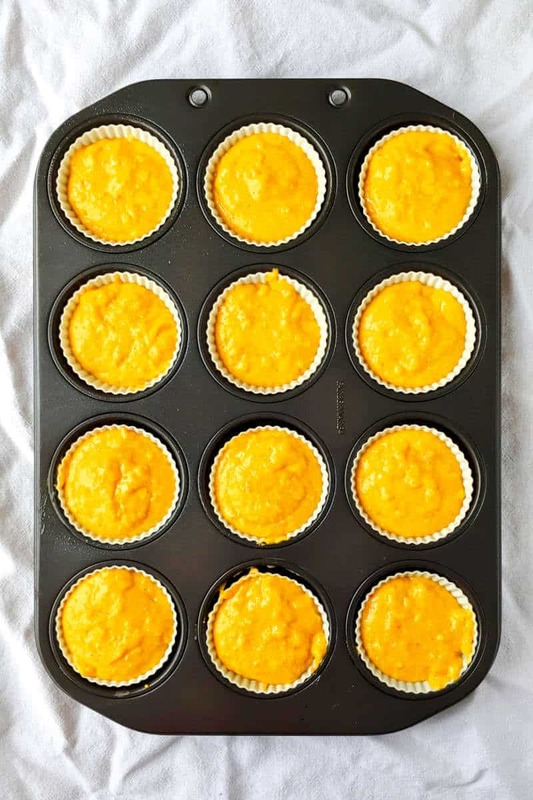 I adapted this recipe from the original Vegan Clementine Cupcakes over at King Arthur Flour, but my version is even easier. 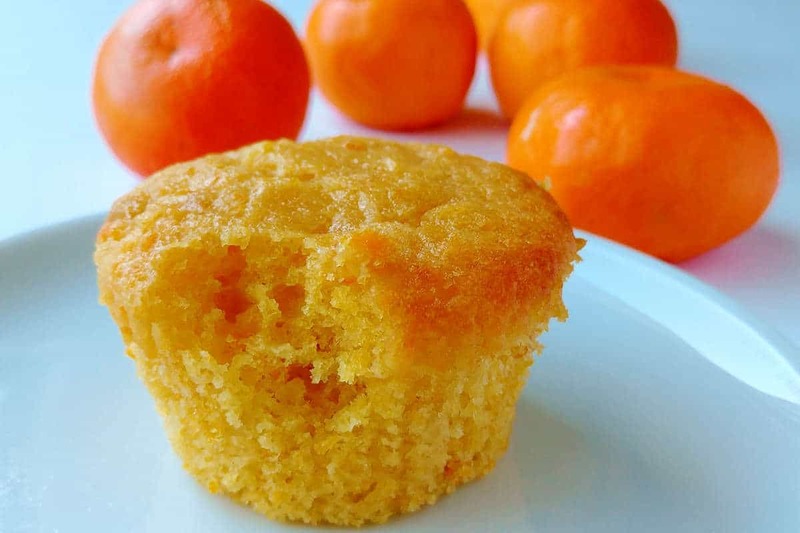 Since oranges are what make these cupcake/muffins special, let’s talk about them. Slice off the ends (and any discolored spots of peel) of your clementines. You may only need 2, but I usually blend 3 for good measure. I can fit 3 (halved or quartered) clementines in my bullet blender (affiliate link), but you can use a regular blender or food processor if you’d like. If you don’t have a way to puree the oranges, you can try to chop them as finely as you can. Chop the peel and any pith separating the segments especially finely, as it will not dissolve into the cupcakes as well as the pulp will. I cannot guarantee that chopped oranges with peel will work as well as pureed oranges. 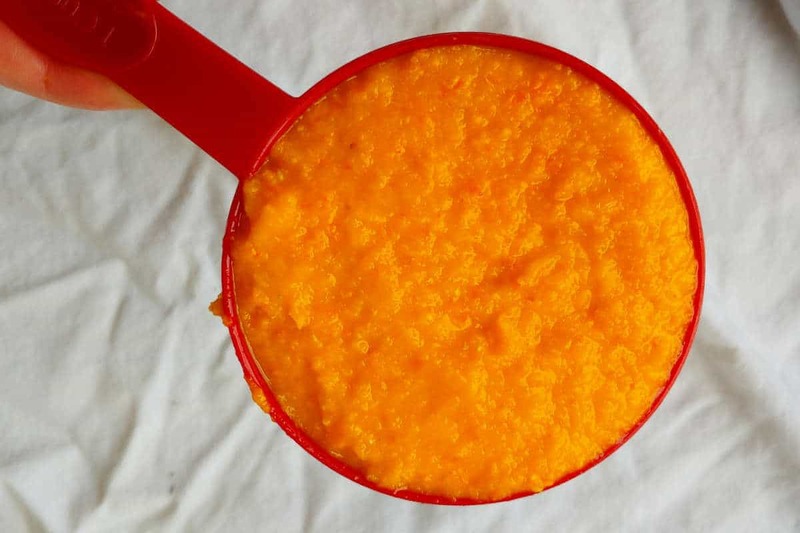 Measure out 1 cup (about 8 ounces/227 grams) of orange puree to use in your cupcakes. Next, measure out 2/3 cup (5 1/3 ounces/150 grams) orange juice; I always use a carton of juice for this because I’m lazy and don’t like juicing oranges. If you don’t have enough puree, you can can add extra juice to make up for it; that is, use 2/3 cup puree and 1 cup juice. You can also use a little extra puree and a little less juice if necessary. Once you’ve got your orange puree and orange juice measured, making the cupcakes is pretty easy. Whisk together dry ingredients. Add orange puree, OJ, and other liquid ingredients to the dry ingredients, and stir. It will foam up! Fill greased muffin cups 3/4 full (almost all the way to the top), and bake! Easy as cake! If you’d like to make them prettier, sprinkle them with sparkling sugar or regular granulated sugar before baking them. They’re beautiful without it too, as you can see in the pictures below. This will yield about 12 cupcakes. I used reusable silicone cupcake molds, which make the cupcakes a little smaller and so I consistently get 13. If your muffin tins are on the small side, you may get a few extra. Cupcakes stay moist in a sealed container for several days. 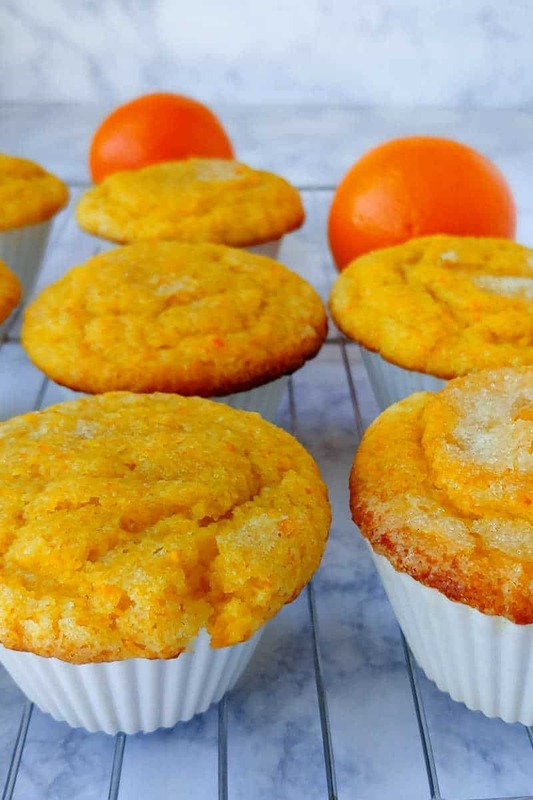 There’s no wrong way to serve these orange cupcakes. Without frosting, as I always serve them, they’re really muffins. I take them to playdates and foist them on moms and kids alike. No one turns them down. These cupcakes are great as a healthy-ish addition to birthday parties (especially if topped with sugar before baking, or garnished with frosting or a drizzle of icing). Since they are so brightly flavored and springtimey, they’d be great as part of an Easter brunch or for a special treat for someone on Mother’s Day (or any weekend morning). They’re already dairy- and egg-free, but I expect they would be easily made gluten-free by using a gluten-free flour blend that includes xanthan gum. (You will need the binding ability of xanthan gum since this recipe includes no eggs.) Look for a blend that includes rice flour, which will be neutral in flavor; I found it usually worked best the few times I made gluten-free sweets. Note: I don’t argue that there’s Vitamin C in these cupcakes. Yes, Vitamin C is in the oranges and orange juice, but I remember from a nutrition class that I took that it’s heat- and light-sensitive. So, it’s largely gone by the time they’re baked. Sorry. 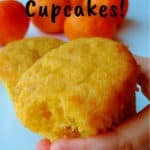 However, cupcakes are still delicious, and I’m sure there’s still fiber from the oranges! I hope you enjoy these as much as we do! 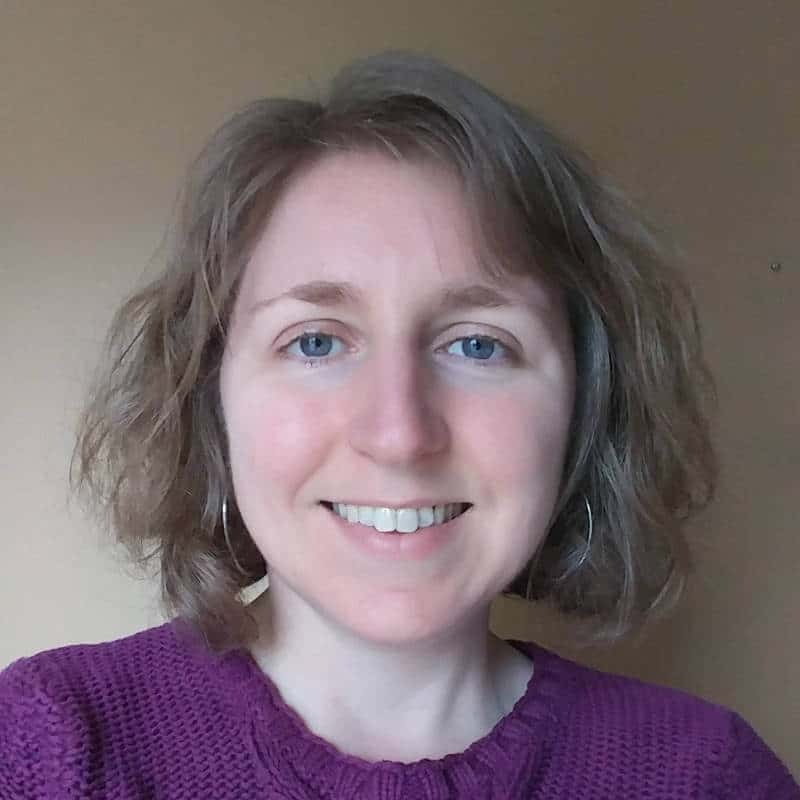 If you’re interested in other citrusy recipes, check out Grapefruit Yogurt Cake, Grapefruit Scones, Lemon Bars, and Lemon Raspberry Muffins (although the recipe is way down at the bottom of the page). 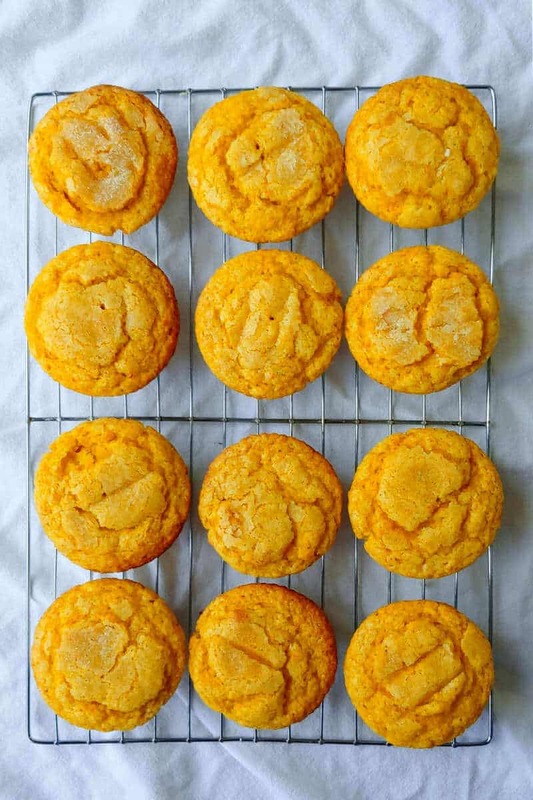 These orange cupcakes burst with orange flavor. They’re springy (in both texture and seasonality), fluffy, and super moist. 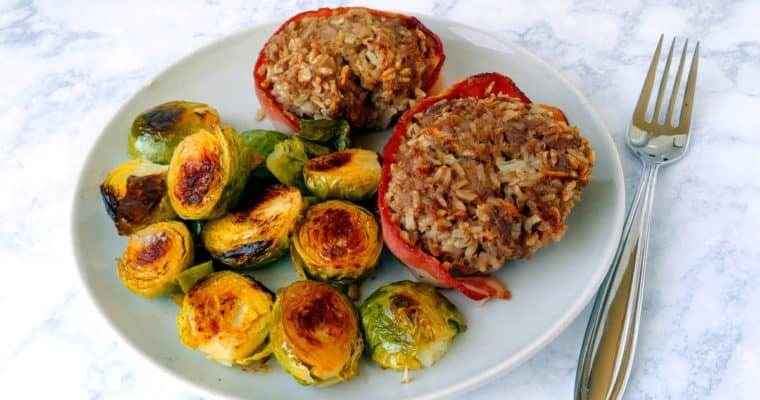 As a bonus, they happen to be vegan – dairy and egg-free! Combine flour, sugar, salt, baking powder, and baking soda in a large mixing bowl. Puree clementines. Slice off the ends and any rough or discolored peel. Puree until about smooth. Measure out 1 cup. Measure out your 2/3 cup orange juice. If you didn’t have enough puree, add extra orange juice to the puree to make up the difference. If you had extra puree, you can use it in place of some of the orange juice. Your choice. Add the orange puree, orange juice, vanilla, and vegetable oil to the dry ingredients. Mix just to combine. Do not overmix. The mixture will foam up some. Scoop the batter into greased or lined muffin tins. Fill them 3/4 full, almost but not all the way to the top. (If you fill them all the way, the batter may overflow and you’ll have muffin tops – no one likes a spread out muffin top.) If you have extra batter (you might if your muffin tins are small), grease a few extra muffin cups and bake immediately. (I consistently get 13 cupcakes.) Sprinkle with sugar before baking if desired. Bake at 400 for 15-18 minutes. A toothpick inserted into the center will come out clean when the cupcakes are done. Cool for 5 minutes, then carefully remove cupcakes from the muffin tin to cool on a rack. If desired, top with vanilla or orange frosting (see King Arthur Flour for details). Pureed oranges in these make the cupcakes/muffins very moist. You can try to make them if you don’t have a blender/processor, but you must chop your peel very finely. I cannot guarantee the recipe will turn out with the oranges just chopped. 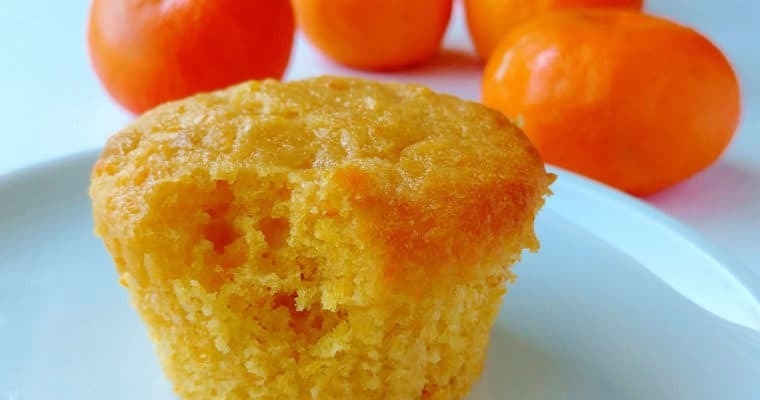 Since you include the orange peel in the cupcakes, you want a very thin-skinned, sweet, not-bitter orange. And it should be seedless. Clementines are perfect. 2 may be enough, but I use 3 to be sure to have enough puree. This recipe makes anywhere from 12-17 cupcakes, depending on the size of your muffin tin. 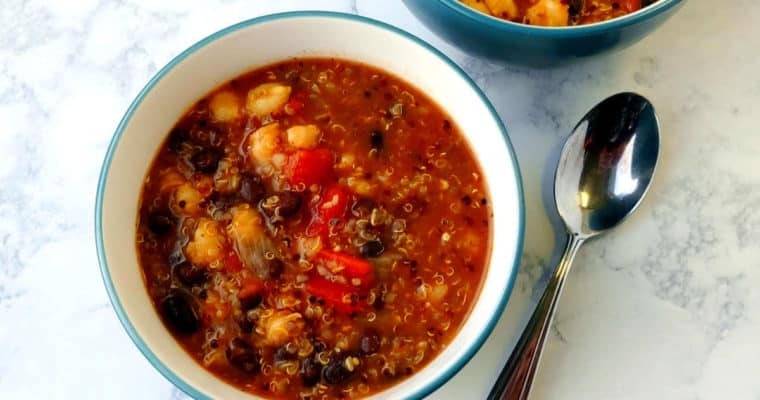 I have not tried it, but I believe this vegan recipe could easily be made gluten-free by using a gluten-free flour blend including xanthan gum (for its binding properties, since this recipe does not include egg). Look for one that includes rice flour, which should have a neutral flavor. This recipe was originally adapted from King Arthur Flour.